The crisp, rhythmic texture of the exterior cabinetry is showcased by illuminated corners that offer a touch of whimsy to the beautiful architecture. The spa’s low profile and wide, flat-top rail also houses a SunCooler™ cold storage area to keep beverages conveniently within arm’s reach. The upgraded Accu-Ssage™ therapy seat is a customer favorite, providing a deep-tissue massage via patented Fluidix® massage jets for full-body immersion and relaxatoin. Simultaneously soothe your muscles and senses with specialty Silent Air®injector jets and SunScents™ Aromatherapy for complete relaxation in your own backyard. The glowing Glass i-Touch Control allows you to enjoy your spa day or night with simple icon-driven menus, and is compatible with the SmartTub™ app so you can monitor and manage your spa from anywhere at any time. 980™ MicroClean® Ultra Filtration System with horizontal MicroClean® Ultra Filter, SlipStream™ weir, Dynamic Flow™ Circulation Pump and CLEARRAY® system. Architectural corner lighting highlights the exterior while color-changing LED lights illuminate built in SunCoolers™, a soothing waterfall and softly highlights key seats. Integrated cold storage with illumination, removable lid matching exterior cabinetry and pump-assist drain for convenience. 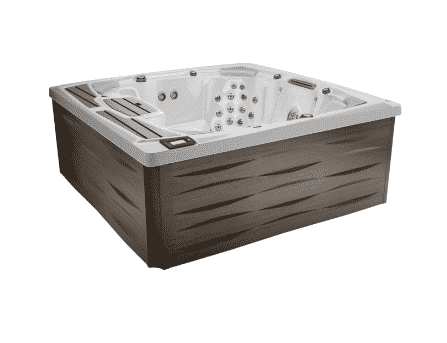 Also serves as additional seating for socializing out of the water without leaving the spa.